A ruthless extraterrestrial villain - in reality an ingenious humanoid computer created by the sinister computer tyrants of a far-distant planet - who has been an implacable foe of Superman since July, 1958. Brainiac is an evil space mastermind and fearsome super-foe with an arsenal of awesome nightmarish scientific weapons at his command, and is perhaps the most terrible evil-doer in all the universe, a creature of superhuman intelligence, great scientific ability, and utter ruthlessness who is said to know the universe as no mere man knows it. 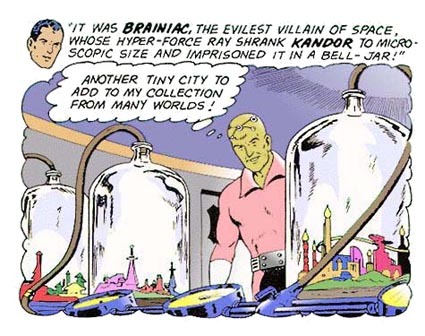 It was Brainiac who, sometime prior to the death of the planet Krypton, literally stole the Kryptonian city of Kandor, reducing it to microscopic size with a diabolical shrinking ray and preserving it aboard his spacecraft inside a large glass bottle until it was finally recovered by Superman and placed for safekeeping inside his Fortress of Solitude. Although Brainiac - with his green eyes and light-green skin - closely resembles the humanoid native inhabitants of the far-distant planet Colu, he is actually a sinister computer spy created by the computer tyrants which had seized control of that planet as the first step in a scheme of interplanetary conquest. With Colu's computer masters having long since been overthrown and destroyed in a great revolution that toppled them from their pinnacle of planetary power, Brainiac now remains as the last of the mighty computer minds who has striven to keep his computer identity a secret, who is devoid of human emotions, and whose single greatest weakness may be his lack of insight into human psychology. In his initial appearance he is portrayed as completely bare-headed, but later texts portray him as having a network of electronic devices atop his head which are described as the electric terminals of his sensory nerves. Brainiac is sometimes accompanied on his marauding journeys through space by his alien pet, Koko, a white extraterrestrial creature which closely resembles a small monkey except for the twin antennae protruding from its forehead. Because he is a master of super-scientific forces as well as the most terrible of all space villains, Brainiac possesses an awesome arsenal of super-scientific weapons and devices to aid him in his never-ending war against Superman. Even Lex Luthor, the world's most dangerous criminal scientist, has been moved to adopt some of Brainiac's more ingenious devices. Perhaps the most important weapon in Brainiac's arsenal is his ultrasophisticated space-time craft, a weird vehicle capable of accelerating to such phenomenal velocities that it can literally penetrate the time barrier and travel through time as well as space. Portrayed sometimes as a flying saucer and at other times as a bizarre, light-bulb-shaped vehicle, it is surrounded by an invisible force field - or ultra-force barrier - which nothing in the universe can penetrate, and is crammed full of superscientific apparatus, including the amazing hyper-force machine built into the control panel. It is by means of the hyper-forces emanating from this ingenious device - which is described as powered by hyper-batteries energized by cosmic rays - that Brainiac committed what has been called the greatest crime in the universe: the shrinking of the Kryptonian city of Kandor to microscopic size so that it could be imprisoned aboard his space-time craft inside a large glass bottle. The hyper-force ray is referred to as a reducing ray in at least one text and as a shrinking ray in several others. Another superscientific apparatus employed by Brainiac is the special power-belt which surrounds the villain with an impenetrable ultra shell which even the heat of Superman's X-ray vision cannot penetrate. Brainiac is a villain of such outstanding notoriety that Superman has devoted an entire room to him in his Fortress of Solitude. The so-called Brainiac Room contains a statue of the villain, a model of his space-time craft, and an array of scientific machinery constructed by Superman in connection with his experiments aimed at penetrating Brainiac's force-field. In his early textual appearances, Brainiac is portrayed as a sinister alien who has been roaming the universe in his spacecraft, using his hyper-force machine to kidnap whole cities from various planets so that he can use them to found a new empire on his own desolate world, where the population has been decimated by a hideous plague. Indeed, the inference is unmistakable that Brainiac was once the ruler of the planet he now seeks to repopulate in this mosaic manner. "Yes, Koko," he gloats to his alien pet after stealing Paris in July 1958, "I will take a dozen cities-in-the-bottle back to repopulate my home world, where a plague wiped out my people! Then I will restore all the cities to their original size and have a new empire to rule, as before!" In February 1964, however, while probing the universe with his time-space thought-scanner in the hope of locating an ally capable of helping him destroy Superman, Lex Luthor discovers that he has contacted a vastly powerful mind on a distant planet, years in the past. Carefully adjusting the controls of his uncanny instrument in order to get the mental picture clearer, Luthor finds that he has tuned in on the mind of Master Computer One, an electronic brain of towering intellect created by the green-skinned humanoid inhabitants of a far-distant planet. "A human mind is only a sixth-level effector," remarks one of the alien scientists associated with the construction of the master computer, "but the new computer is built to be a tenth-level effector!" As the years passed, the green-skinned aliens built many such computers. Before long, however, the powerful master computers had wrested control of their planet from the humanoid civilization that had created them and had begun using weapons of awesome destructiveness to enforce their tyranny over the people. As Luthor continues to survey the history of this distant planet with his time-space thought-scanner, he learns that the power-hungry mechanical minds soon concocted a diabolical scheme of interplanetary conquest. "We must extend our wise rule to all worlds governed by foolish humans!" asserted one computer, "First we'll send a computer spy to reconnoiter those worlds!" "Our spy would be detected and destroyed unless he deceived them by looking human," observed a second computer, "We'll make a computer of powerful intelligence that looks human!" And so, in the weeks that followed, an ingenious computer spy was built to carry out acts of interplanetary espionage for the evil master computers that had created it. Although their advanced technology would have enabled them to equip their new spy with a twelfth-order mind superior to their own, the computers decided to endow it with only a tenth-level effector mind as a safeguard against its attempting to capitalize on its superior intelligence in order to dominate its creators. The master computers christened their humanoid computer-spy Brainiac. To ensure that he would not only look human, but act human as well, they fed the mental patterns of one of their planet's scientists into Brainiac's memory banks, thereby endowing him with a full range of human mannerisms. The master computers attempted to further enhance the credibility of Brainiac's human masquerade by selecting a boy from among their planet's green-skinned inhabitants to accompany Brainiac on his travels and pose as his son. The youngster chosen for the task, whom the master computers renamed Brainiac II, had no intention of allowing himself to become the tool of an evil computer, however, and at the earliest opportunity he ran away and escaped, forcing Brainiac to climb into his spacecraft and set out on his interplanetary espionage mission without him. It was this boy who, in Brainiac's absence, ultimately led his people in the great revolution that destroyed the computer tyrants that had seized control of their planet. That courageous youngster, whose real name was Vril Dox, was the ancestor of Brainiac 5, one of the members of the Legion of Super-Heroes.